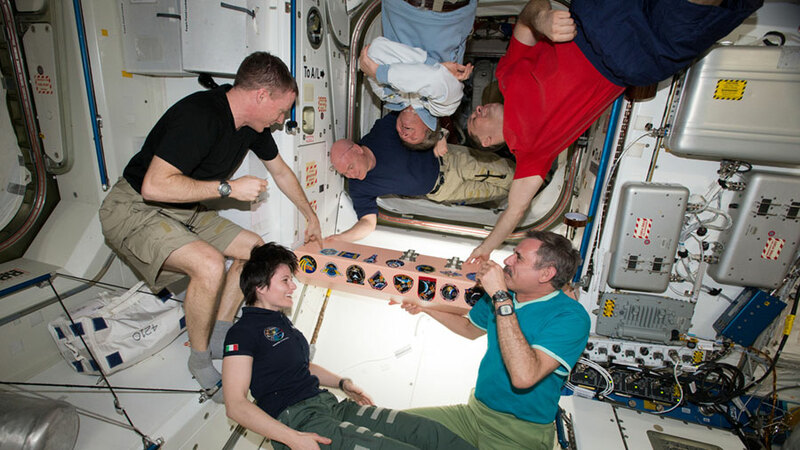 ISS043E270899 (05/30/2015) — The Expedition 43 crew gathers aboard the International Space Station to affix their mission patch to the vehicle. Spacesuit maintenance took up most of the day for a pair of astronauts. Crew members also explored the long-term effects of microgravity on the brain and vision. Commander Terry Virts joined Italian astronaut Samantha Cristoforetti in the Quest joint airlock to swap out a fan pump separator inside a U.S. spacesuit. The duo are checking the device after earlier maintenance work revealed it wasn’t functioning properly. Before that work began, Cristoforetti relocated the Protein Crystallization Research Facility in Japan’s Kibo lab module. Virts wrapped up his workday with some maintenance in a science freezer ensuring it stays cold enough to store biological samples for later analysis. One-Year crew members Mikhail Kornienko and Scott Kelly joined fellow Soyuz crewmate Gennady Padalka for ongoing Fluid Shifts experiment work. The trio received assistance from ground operators as they collected vision data using a variety of medical tools. Watch an interview with Mike Stenger, one of the co-principal investigators of the Fluid Shifts experiment. All of you Used The “ISS “like a 0 gravity PLYGROUND, ! !